The book is divided into three sections: “On the Trail,” “Car Camping,” and “Backcountry Camping.” Each contains useful advice for meal planning, cooking tips, a list of essential gear, and recipes. The authors’ experience and exuberance resonate throughout. There is clear instruction and motivation for enjoying the outdoors, whether one is considering a simple day hike with young kids and a backpack filled with fun picnic foods or launching a restorative week-long backwoods getaway with friends, capped with end-of-trail cocktails and desserts. The emphasis is on healthy, energy-rich, mostly vegan and vegetarian meals (customizable for omnivores), though there are helpings of awesome eats for carnivores and sweets fans (Barbecue Pie Bombs or Pecan Praline Fondue, anyone?). While most meals involve simple prep and cooking techniques, there are detailed explanations of campfire cooking methods and lots of hearty breakfast ideas to jump-start physically active days. There are some surprising and inventive recipes, too, such as English Muffins from scratch with homemade skillet jam, elegant Baked Brie with Candied Pecans, Campfire Bibimbap, and Ecuadorian Canelazo, a hot drink concocted of spiced rum and orange juice. Chatty recipe introductions exhibit a lot of humor and personality, and there are many reminders to demonstrate respect for the natural environment by packing everything out, properly dousing campfires, and critterproofing campsites. 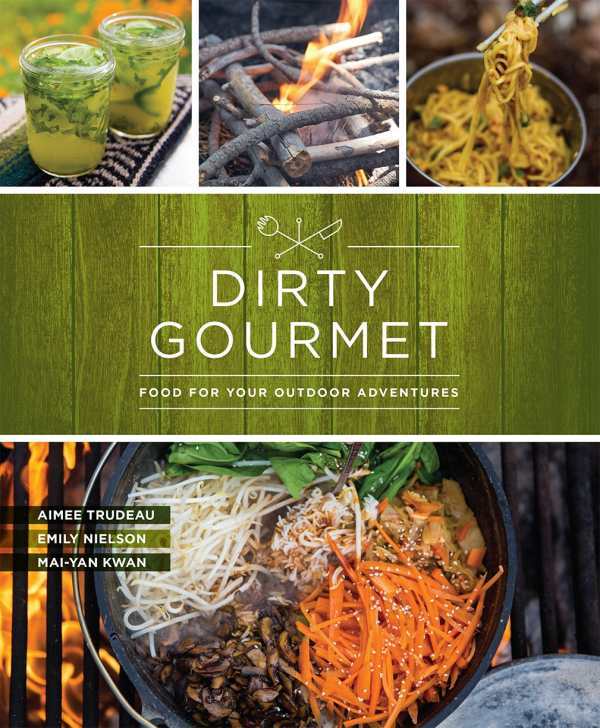 The trio have a deep love of backcountry camping, noting that “the farther into the wilderness we get, the happier we seem to become.” Hopefully, this book will inspire more folks to get outside and get cooking.